Toronto’s west-end Kingsway Village neighbourhood is a district of quiet streets, wide lawns and mature trees. It was there that Julie and Tom Fluelling found themselves captivated by a building from the past: a 1942-vintage home. “When we bought the house, it had been with the previous owner for 40 years,” says Julie. 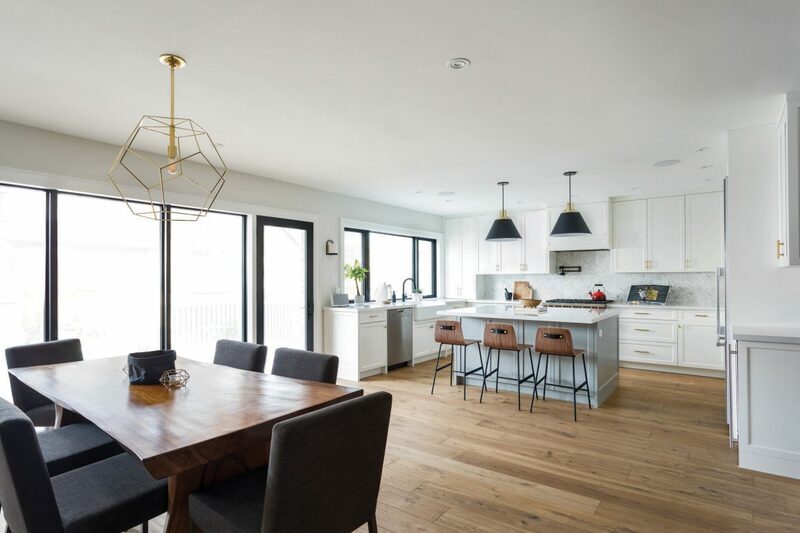 The Mara pendant lamp from Arteriors above the table and Lewis Dolin hardware on the kitchen cabinetry warm up the cool background in the newly combined cooking-and-dining area, while such subtle details as the herringbone marble backsplash add interest. 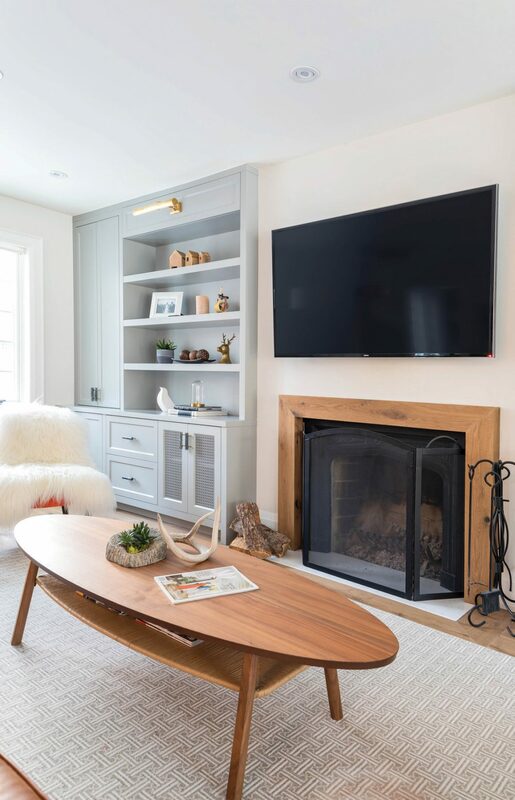 She and Tom lived with its charms and drawbacks for about five years before deciding to transport their living space forward in time to match their 21st-century lifestyle. Among the plusses: they loved the stonework on the exterior, the unusual arched front doorway and the functional fireplace. Drawbacks included a ground floor without sightlines between rooms (a challenge for parents of two young children) and dark, narrow oak flooring — not to mention outdated lathe-and-plaster walls, knob-and-tube wiring and antiquated radiators. Architect Richard De Oliveira of Re:Placement Design Inc. and interior designer Sarah Townson of DXT Studio pulled the home into the present day with a two-storey rear addition that created a new master bedroom and a series of seamless transitions between living room, dining room and kitchen. 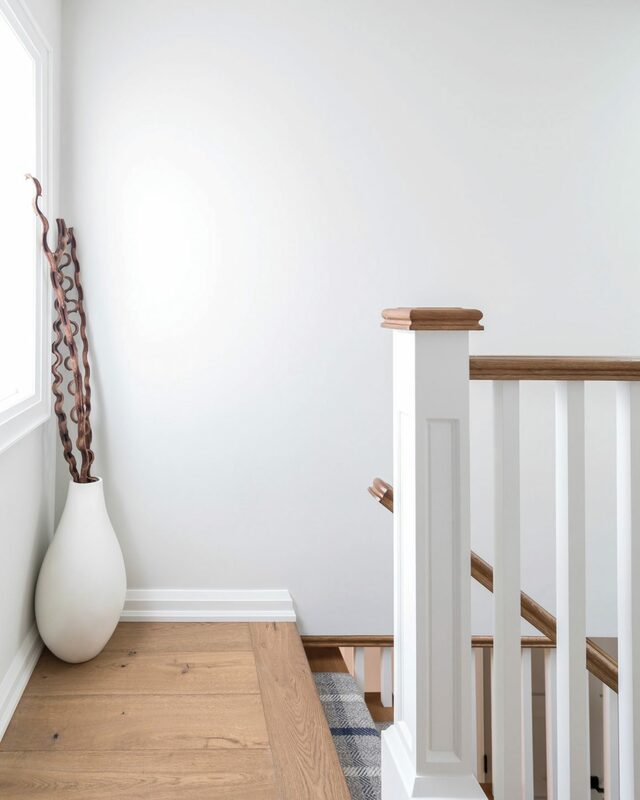 Versatile and durable, new white oak hardwood flooring from Grebian Flooring Solutions lifts the look of the previously dark interior throughout the ground floor and complements the pale walls. Light now floods the ground floor from windows in the extended rear of the home. 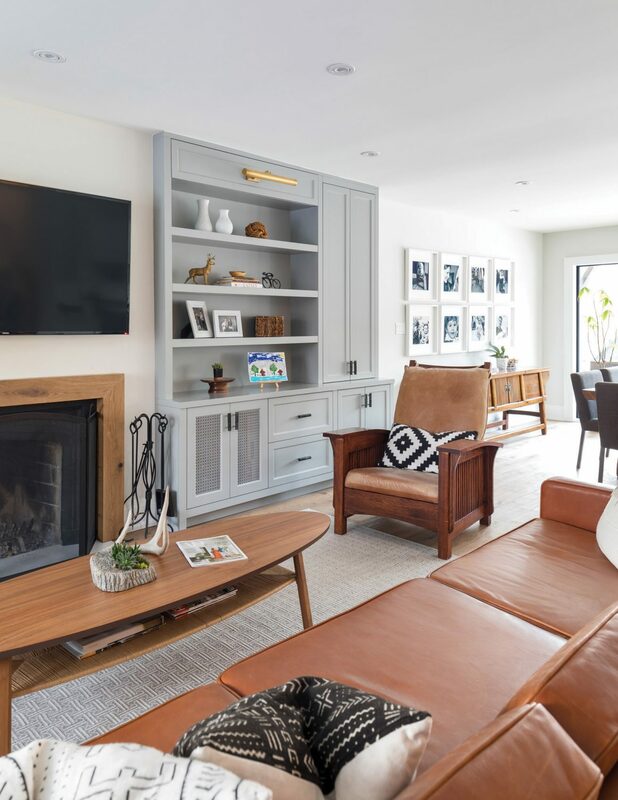 “What’s nice about that is that it’s an open plan and it’s a family-friendly space, but there’s still a little space reserved for privacy in the den,” says Townson, referring to a shared home office at the front of the ground floor. 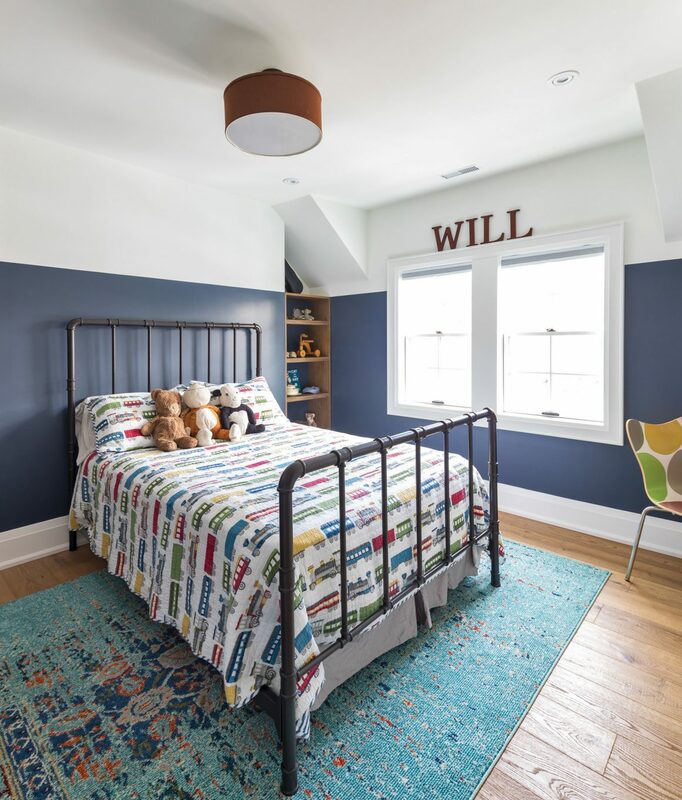 For a family with young children, capacious custom built-ins provide for quick tidying-up of toys and books. Personal treasures displayed in symmetrical shelving that flanks the wood-framed fireplace are illuminated by Circa Lighting’s dignified antique brass picture lights from Elte. The wartime years of the 1940s were an era of sharing resources, taking turns and making do — a spirit that’s evident in the Spartan bathroom design of the period. 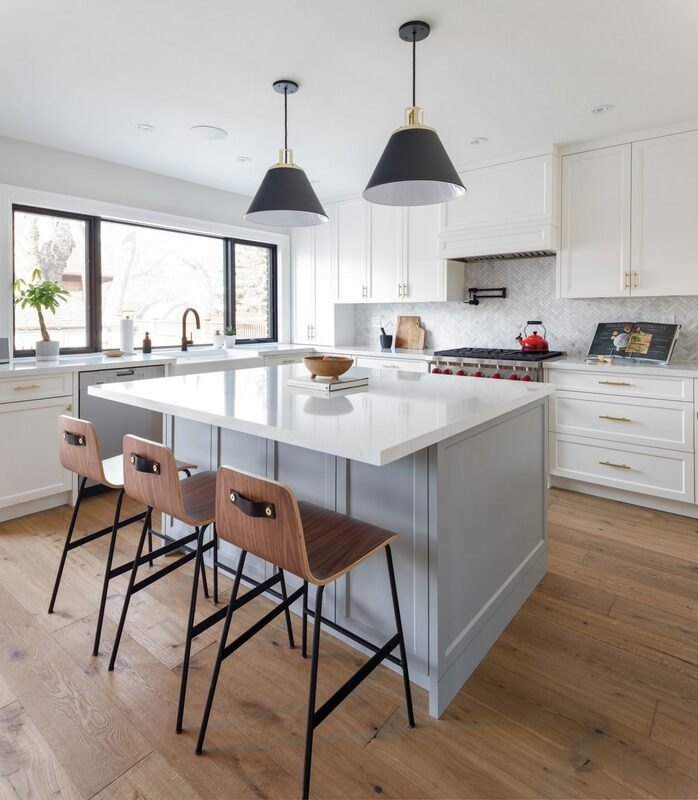 When the Fluellings moved in, their home had two bathrooms: one in the basement and one on the second floor to serve the occupants of three bedrooms. To bring the domestic arrangements up to 21st-century standards, a new master ensuite bathroom was added to the second floor, and a powder room was tucked behind the office just off the front living room. The basement bathroom was also updated. 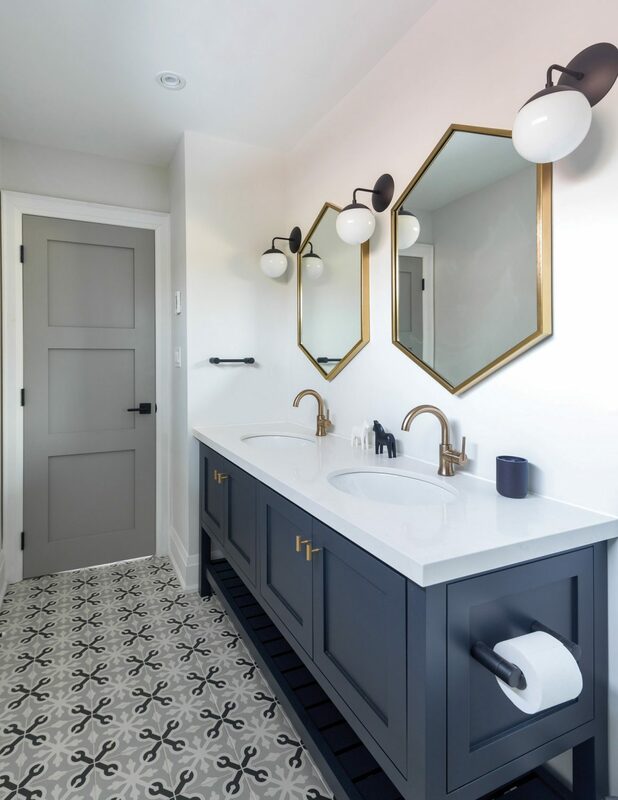 The original upstairs bathroom, conveniently located at the top of the stairs, was reimagined for the children and occasional guests with two quartz-topped sinks that look ahead to the time when toddlers have become teenagers. 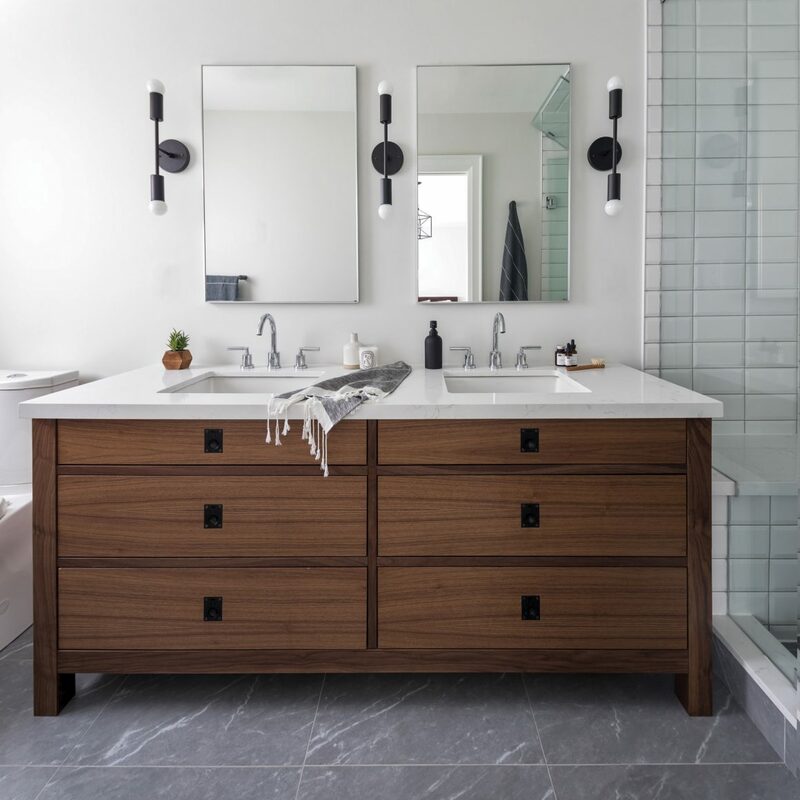 The master bathroom is an exercise in understated luxury, with its subway-tiled steam shower, heated floors and custom-made walnut double vanity. 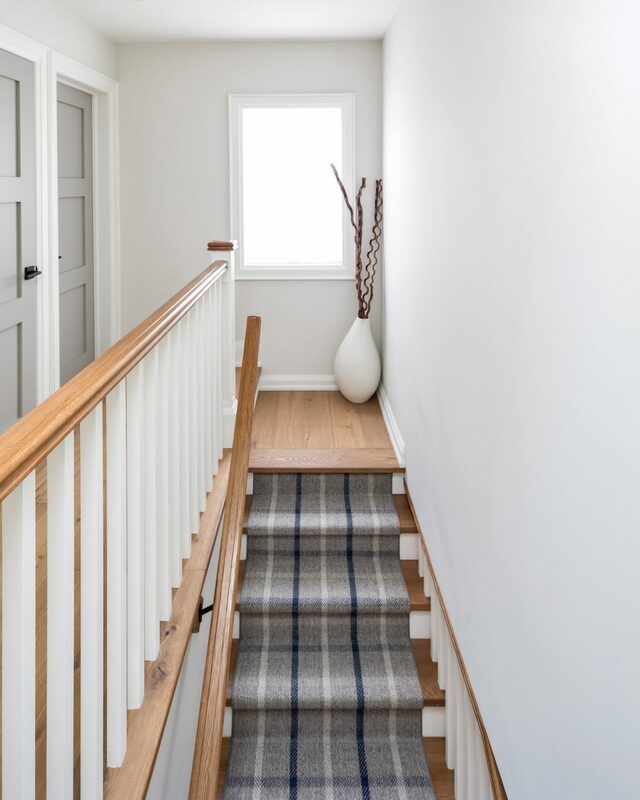 Unexpected floor treatments, such as the stair runner from Grebian Flooring Solutions, work well with neutrals. Distinctly grownup Llagostera Gris tiles from Mettro Source give the flooring extra character. “I’ve used one of the other tiles in that line and I loved it so well I really wanted to use this one, too,” Townson says. 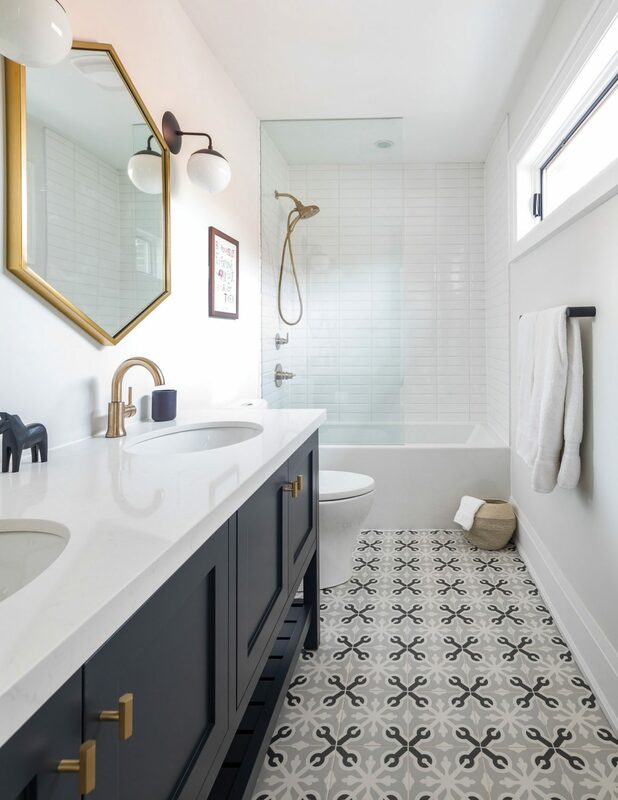 To give the master bathroom a streamlined gleam, she added a luxurious steam shower with bevelled tiles on the walls and Marmoker’s Bardiglio Imperiale porcelain tile on the floor. The children’s bedrooms are likewise a far cry from what they might have looked like when the home was built. 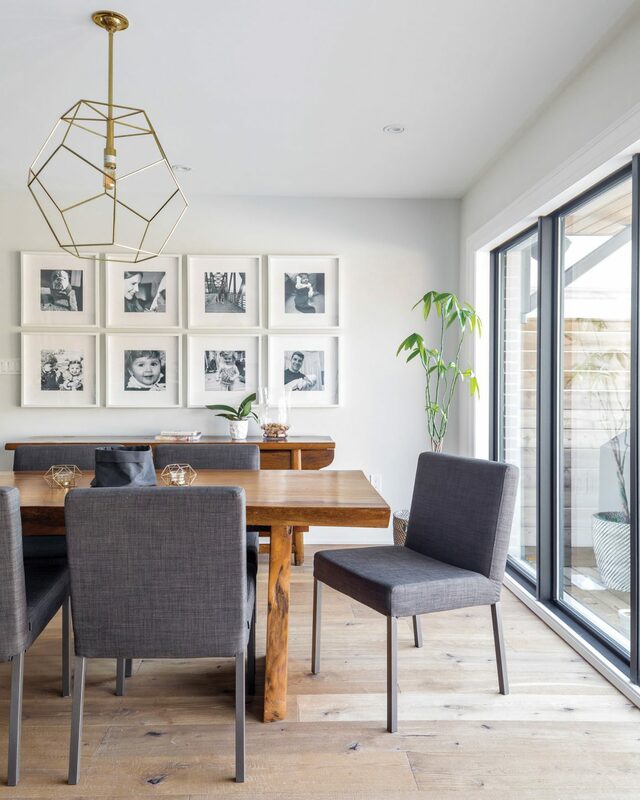 Airy and bright, with minimal window treatments and sturdy but lightweight furniture, they accommodate childish play now, yet also offer space to grow in the future. Playful bed linens, candy-coloured carpets and of course the toys are the only clues that these paired bedrooms are for children. 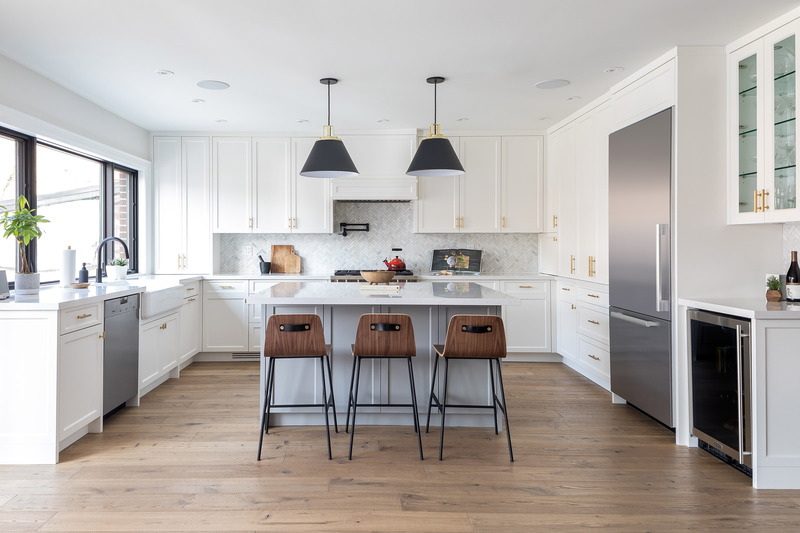 Later, the classic colour schemes and understated light fixtures will transition easily into suitable spaces for teenagers and young adults.